However, I have a couple Tanaka bars and am going to try to sell them (save money to use for palladium)...on Ebay...for 120% of its value like everyone else does (I bought a few coins last month at 150% of their value so I guess it's fair). I don't see gold rising faster than the money I'm hoping to invest in my own business, so I'll sell, make money by working, then have more money to use for palladium! Anyway, my question is: Are these bars well-known? I don't find any on Ebay and not much mention of them anywhere except in Japan. They're great quality, and I only choose them over the American coins because they were charging a $60 premium for each coin, so I would have had to pay $120 more as compared to buying an equal amount in bullion bars. Do you think it'll sell? I'm pretty good with my wording and responding to possible buyers. 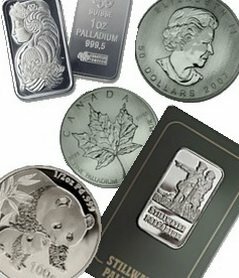 I was thinking to put $1750 on a 50 gram bar and see what happens. If sold at that price, my Ebay + Paypal fees would total $100. Will let you know!